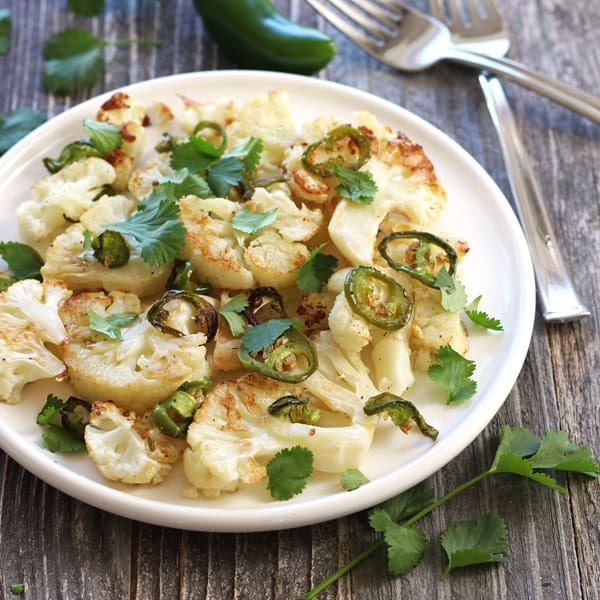 Jalapeño Roasted Cauliflower, add a little sass and spicy heat to your mild mannered roasted cauliflower. Cheeks flushed, feeling the heat creeping in. Your tongue swells slightly while a familiar tingle dances around your mouth. Spicy food fans know what I’m talking about. Contrary to what your spouse/mom/best friend thinks, you’re not looking to set your mouth on fire. Or blow out your taste buds. Though the tongue tingling peppery heat is seductive. Nope. 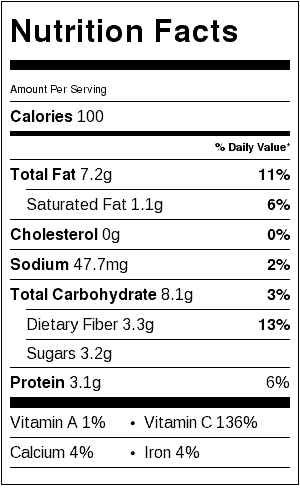 For you, it’s about the flavor. Granted some spicy sauces and fresh peppers are wildly hot and overpowering. But others, when used with a light hand can quietly turn an ordinary side dish into something special. A surprising treat full of flavor and texture with a touch of feisty pepper heat. Instead of chopping cauliflower into bite-size bits. Slice it into thicker “steak-like” pieces instead. This way you get more surface area touching the roasting pan. That means lots of golden caramelization. The end result is crispy, creamy, buttery roasted cauliflower that’s comforting and delicious. And the jalapeños, Oh-The-Jalapeños! They’re crisped and smoky with a tiny bit of heat. Just enough to make your lips lightly tingle. It’s the perfect level of spice for someone looking to dip their toes in the chile pepper pond. Right before diving in, we love to finish the plate with a light sprinkle of citrusy fresh cilantro. If your taste buds aren’t tuned to a cilantro-loving frequency use parsley instead. Or just enjoy the dish plain and simple. Savoring all of its yummy jalapeño roasted cauliflower flavor. 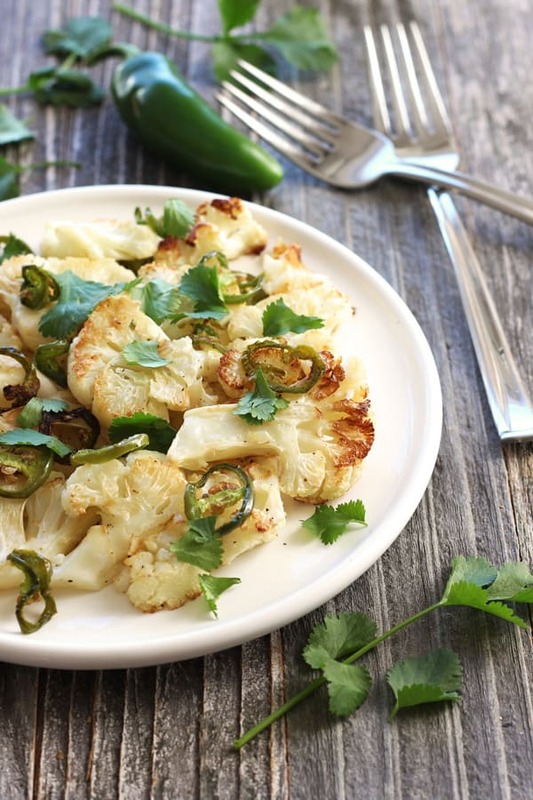 A tasty combo of jalapeño slices and buttery cauliflower roasted together for a delicious veggie side dish. Preheat your toaster oven or oven to 450 F and coat a small roasting pan or cookie sheet with 1 teaspoon of the oil. Slice the cauliflower into 3/4 inch thick pieces. Place cauliflower pieces and jalapeño slices in a large bowl. Drizzle with remaining oil and season with salt and pepper. Mix with your hands to make sure all of the pieces are coated well with oil. Arrange cauliflower mixture in a single layer on the prepared pan and roast for 25 to 35 minutes until crispy and browned. About 20 minutes into the cook time carefully flip the cauliflower to evenly brown both sides. 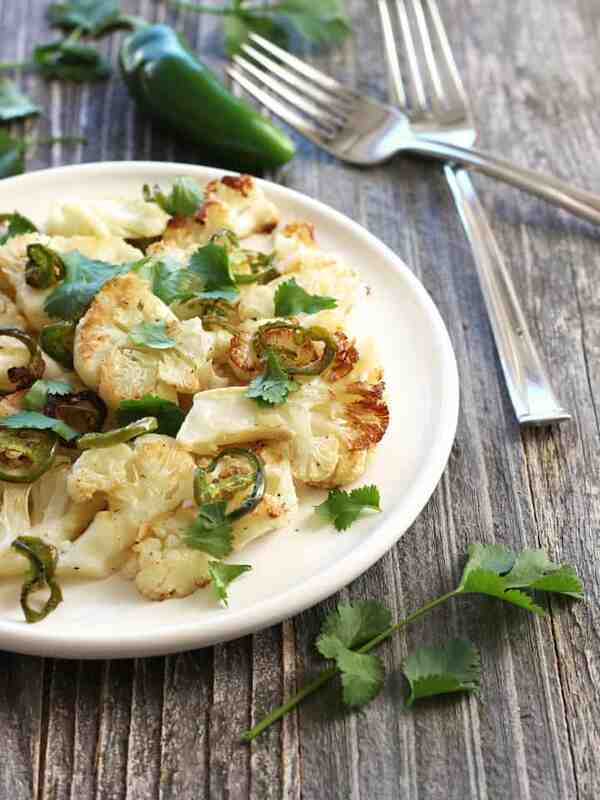 Serve the jalapeño roasted cauliflower warm and sprinkled with chopped cilantro if desired. *For a spicier dish, use two small or one large jalapeño. For crispy and charred jalapeño slices arrange slices on the oiled pan first and then cover with the layer of cauliflower. 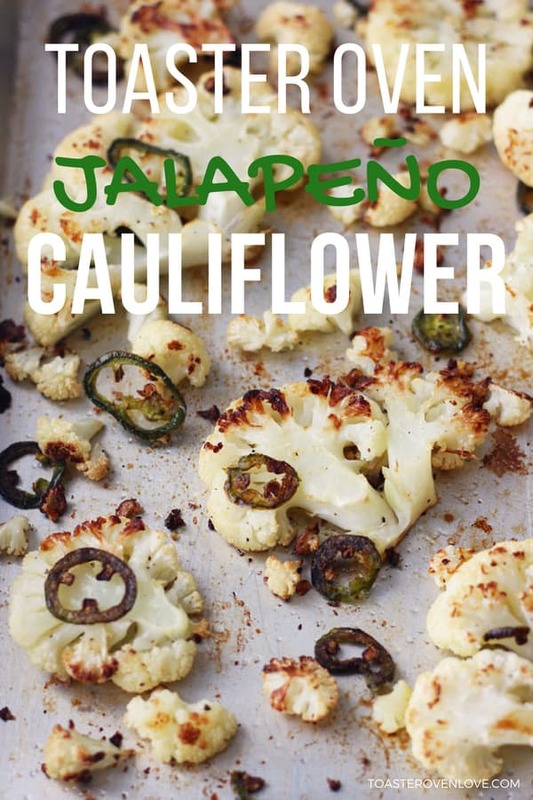 For tender jalapeño slices, spread cauliflower in an even layer on the baking pan and then top with jalapeño slices. i LOVE cauliflower, it’s quickly becoming my favorite vegetable. 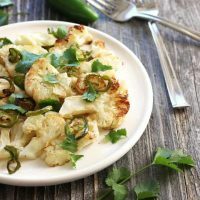 i like this preparation, because though i have no complaints about the texture of properly cooked cauliflower, it does often need a punch of flavor. nicely done! Thanks Grace! Yeah I don’t think anyone will be accusing cauliflower of being bold 🙂 Hope you enjoy the spicy punch of flavor!